I took SO unbelievably long. This is my second Mark Twain book. 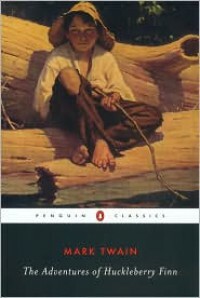 It's supposed to be my third, since I just found out that this is the second book to the Tom Sawyer story. I'm just like, wow. I didn't even find out until after I finished. Mark Twain is a great writer. It's just that I can't help but fall asleep while reading classics.The first half of the book, I completely knew what was happening. The second half, not so much. To be honest, I was stressing because my eyeballs were about to fall out of their sockets, since they were so tired-- so I mostly skimmed and scanned the latter half of this story. But a little researching got my confusion all cleared up.I got the version with the pictures. The pictures were a pleasant addition to this classic novel. The pictures were so amusing, seriously. I found myself just staring at one picture and laughing so hard at the next and yeah. The dialogue was also remarkable, too. That's the amazing thing about Mark Twain- in PRINCE AND THE PAUPER, which was the first Mark Twain book I read, he used old English, and I was just like HOW DO YOU EVEN WHAT IS THIS and in this book, he used Southern accent dialogue. It was fun to read, and I could hear people talking as I read.There were a lot of plot twists. Wow.I feel somewhat accomplished at having read another classic.. yay me!